MADE IN USA. The A1 Studio is handcrafted in premium ash wood with a honey oak stain and Danish oil finish. Material: Ash wood with unique mono aluminium rail. Includes A1 monitor. Requires assembly. Condition is Used. Local pickup only. Solid ash wood and stained in an attractive rose and black two-tone it features the S4 Performance Monitor. This premium rower features a patented water flywheel system that provides a natural rowing motion similar to the feel of actually rowing in a body of water. With the sound of rushing water with every stroke you feel as though you are actually on the water. Designed for all wooden WaterRower machines . Holds your phone or tablet. 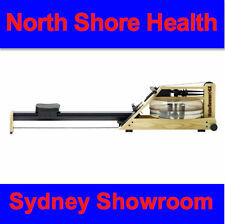 Designed for all wooden Water Rower machines . The WaterRower Club rowing machine is handcrafted in solid ash and stained for color. Each machine is hand finished with Danish Oil, with wood chosen due to its marvelous engineering properties, primary amongst these is its ability to absorb sound and vibration enhancing the WaterRower's quietness and smoothness of use. The following info is from the website describing the CLUB series of rowers: The WaterRower Club is hand crafted in solid Ash and stained for color. Its Black Rails have been styled to prevent scuffing, other wooden components are finished in an attractive rosewood which is more resistant to soiling than the Natural model. PURE DESIGN VR2 VALOR WATER RESISTANT ROWER. This premium rower features a patented water flywheel system that provides a natural rowing motion similar to the feel of actually rowing in a body of water. Rowing flywheel system pulls against water in the barrel, providing a natural rowing motion like being on the water listening to the sound of water. The water rowers unique water flywheel design produce an unrivalled simulation of the benefits of rowing. Designed for all wooden WaterRower machines . Holds your phone or tablet. Designed for all wooden Water Rower machines . Featuring a unique monorail design this series is engineered for use in group-ex rowing classes. WaterRower CLUB Series Water Resistance Rower. Water Resistance - Waterresistance is favoured by lots of indoor rowers because it most closely approximates the physiological experience of outdoor practice. Ash wood with aluminium rail. We also accept direct deposit into our bank account. Display screen with: M/S, MPH. The Water Rower Club rowing machine is handcrafted in solid ash and stained for color. Its rails feature a black stain to prevent scuffing, other wooden components are finished in an attractive rose stain which are more resistant to soiling than the Natural model. The S4 displays all of your important session data such as the length of the session, how many calories you have burned, and even a calculated display for the distance you have covered during the workout. W ATER ROWER. CLASSIC SERIES. the latest range of quality World Class Rowing Machines - WATER ROWER USA. The WaterR O WER CLASSIC Rower. This fitness rower is 100% made and assembled in the USA. WATERROWER A-1 2018 Model. There's no doubt the GX is a stunning looking machine and has the build-quality you would expect from WaterRower. The mix of wood and aluminium works well together and gives a great look and feel. 1 WaterRower A-1 Water Rower. All WaterRower A1 series models are equipped with the upgraded 17" handles. 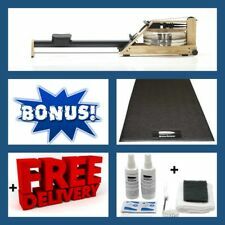 1 WaterRower A-1 Cleaning and Maintenance Kit. WaterR O WER A1 ROWER. WaterR O WER A1. Console Display: Quick-start A1 LED Monitor. Water Rower A1 GX FREE TROJAN 20 KG WEIGHT VEST. More significantly, the water tank and flywheel create a self-regulating resistance system that eliminates the need for a motor. As with real rowing, when you paddle faster, the increased drag provides more resistance. W ATER ROWER. CLUB SERIES. 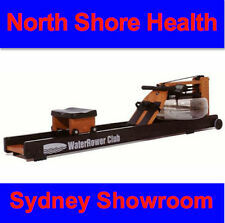 the latest range of quality World Class Rowing Machines - WATER ROWER USA. The WaterR O WER CLUB Rower. latest 2018 model. "MAX-STEEL" SERIES Pro Style Adjustable Abdominal AB Bench. WATER ROWER CLUB. We also accept direct deposit into our bank account. Water Resistance. Made in the USA. Dual Rails. 18 User programs. The WaterRower Club is hand crafted in solid Ash and stained for color. Its Black Rails have been styled to prevent scuffing, other wooden components are finished in an attractive rosewood stain which are more resistant to soiling than the Natural model. W ATER ROWER. OXBRIDGE SERIES. The WaterR O WER OXBRIDGE Rower. · Water Resistance - Water resistance is favoured by lots of indoor rowers because it most closely approximates the physiological experience of outdoor practice. More significantly, the water tank and flywheel create a self-regulating resistance system that eliminates the need for a motor. As with real rowing, when you paddle faster, the increased drag provides more resistance.